The sun shone brilliantly albeit through a light haze. My objective that morning was to photograph a particular shikumen in Xiaonanmen (小南门). And Katya Knyazeva and Ishi Mak were going to take me there. 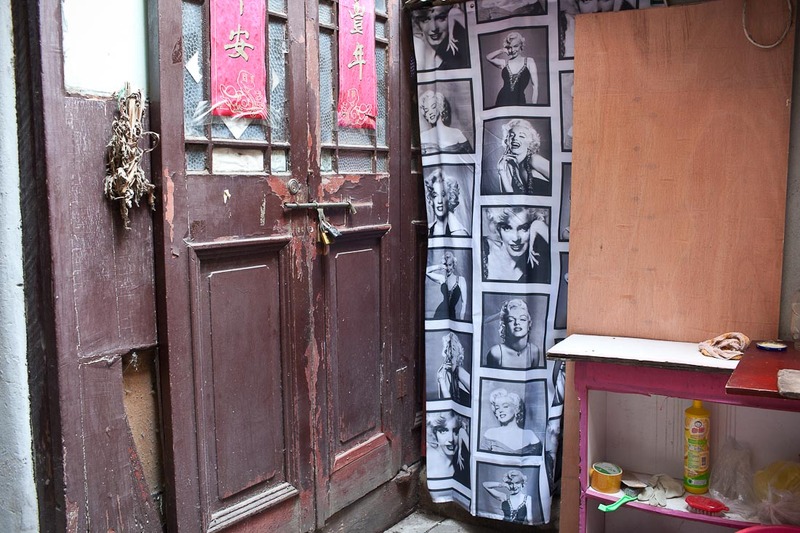 Katya and Ishi, both of whom I have interviewed here and here, have fastidiously documented Shanghai’s complicated and sadly rapidly disappearing Old Town for many years. I often defer to their depthless curiosity and knowledge of Old Town – Katya with her scholarly inquisitiveness of the area’s history and geography, and Ishi with his contemplative eye for the smallest of architectural details. 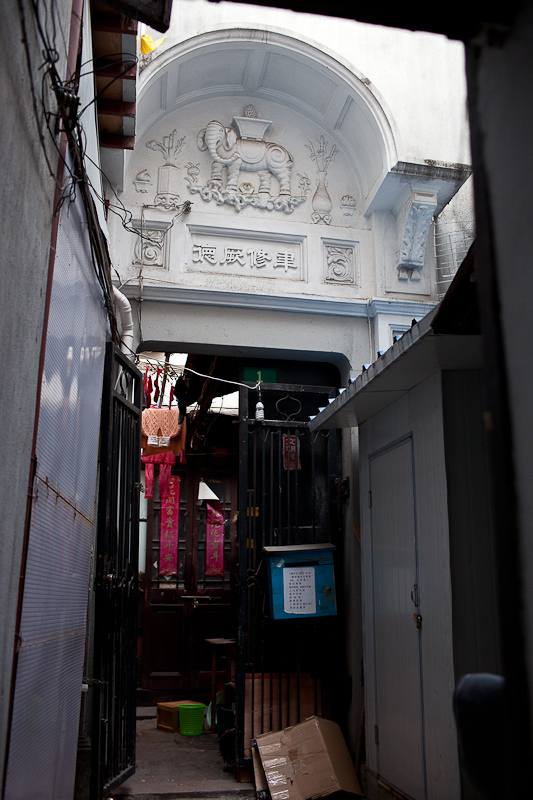 Distracted by the constant chaos of ongoing renovation and demolition in Xiaonanmen, Ishi led me through Wangyima Lane (王医马弄), one of the oldest lanes in Old Town dating back to the 13th century. 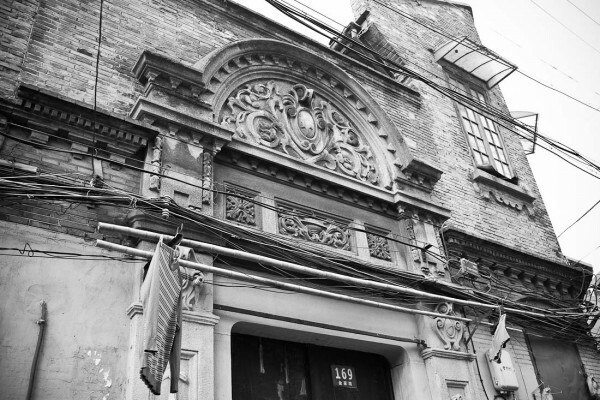 “Medicinal topic resonates with the name of this lane – Wangyima Nong – that is one of the oldest streets in Shanghai, known since the middle of the 13th century. We finally arrived in front of a dark and cramped entrance (or a cave really) connected by a low walkway. 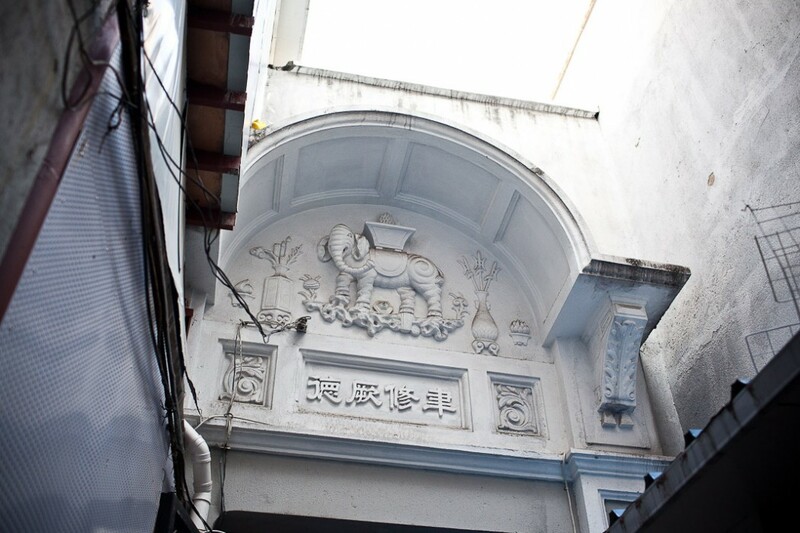 Squeezing through, we finally saw the bold elephant intricately carved into the semi-circular decorative wall over an entrance. 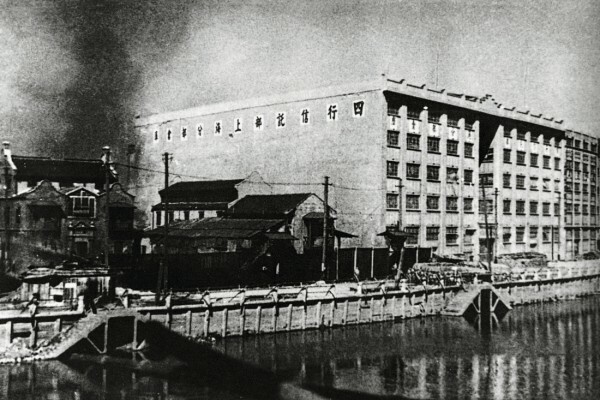 The house was previously known as the Abode of Diligence or Qin Lu (勤庐). The elephant has traditionally been regarded as a symbol of wisdom and wealth, and in this case, represents a prominent and illustrious career. Katya describes the other traditional elements such as the square vase as a homonym for peace, the evergreen plan as aspiration of long life while the three halberds in the vase on the right invoke rapid promotion. For such a snug lane, there was plenty of bustle, Ishi and I had to take turns pressing against the walls to make way for delivery men storing stacks of publications, neighbors in pajamas roaming freely in and out, curious and questioning. 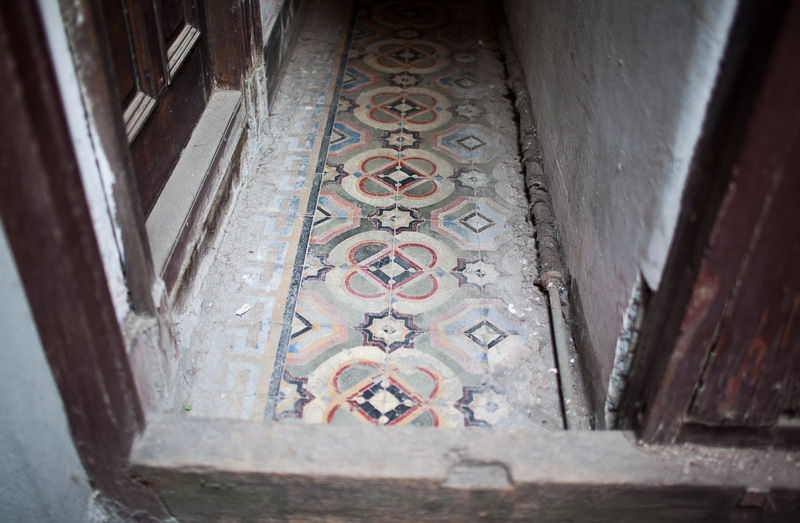 I stole into the courtyard to examine the doors and tiles, slightly hesitant to probe deeper with all the foot traffic around me. 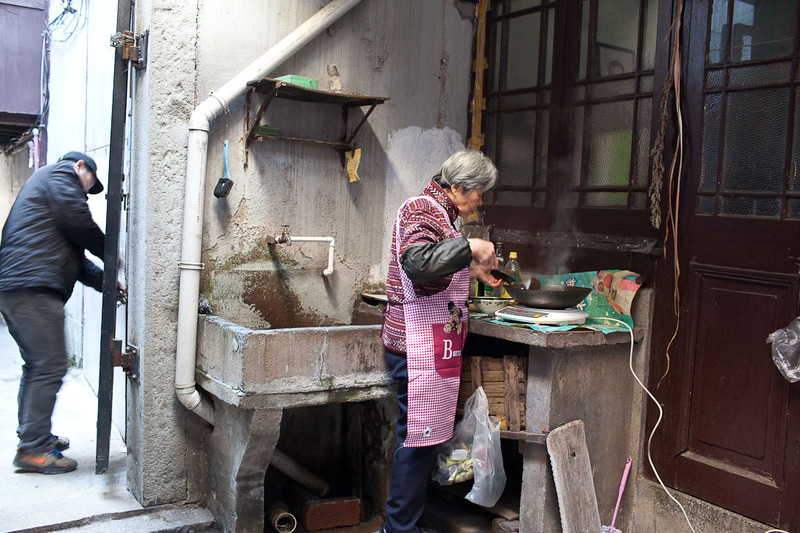 An elderly Shanghainese lady was deep frying fish in pool of oil and dark soy sauce, which smelled sweet and heavenly. 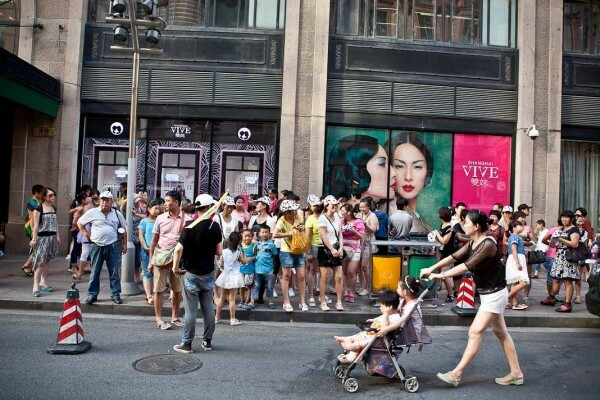 “Over a 100 years,” she spoke in Shanghainese of the shikumen’s history with a quiver, betraying the state of her health. I watched her shuffle slowly over the open stove, readying modest portions of fish, rice and vegetables for a family hidden behind the panel doors. Unperturbed by the noise around her, she quietly slipped into her room, shutting out the world to settle down to lunch.